Israeli PM Benjamin Netanyahu has said the Israeli military may launch a full-scale offensive on Gaza in response to missile strikes into its territory, which intensified on Monday, prompting massive retaliatory fire from Israel. Netanyahu, who was supposed to speak at the American Israel Public Affairs Committee (AIPAC) policy conference on Tuesday, wrapped up his visit to Washington early due to the reports of rockets being launched from Hamas-controlled Gaza into Israel. As he was boarding a plane back to Israel on Monday, the Israeli PM made a thinly-veiled threat to stage a full-fledged invasion of Gaza. “We gave a very, very strong response, and Hamas needs to know that we will not hesitate to enter and do all the necessary steps,” he said. Seven people were reportedly injured as one of the rockets hit a home north of Tel Aviv on Monday morning. 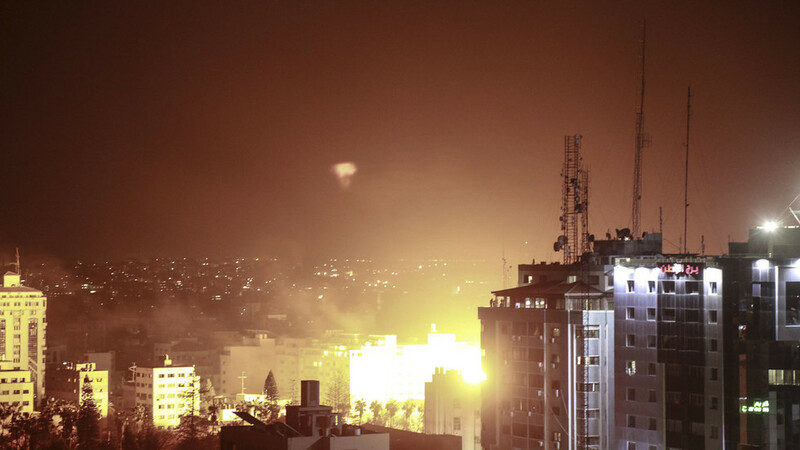 Israel has mounted retaliatory strikes on what it claimed were elements of Hamas infrastructure within Gaza. The Israel Defense Forces (IDF) said it destroyed the office of the group’s leader Ismail Haniyeh, as well as an alleged military intelligence headquarters and internal security service offices. The parties have continued to exchange fire through the day and, as night fell, the flare-up showed no signs of subsiding. According to the IDF spokesman, Palestinian militants launched some 30 rockets into Israel after 10 pm, just as a ceasefire brokered by Egypt was supposed to go into effect. Some of the projectiles reportedly fell into open areas. No casualties have been reported. Israel did not comment on the truce reportedly reached with Egypt’s mediation earlier in the day, while a Hamas spokesman confirmed it in a statement. Further into the night, the Israeli military said it had engaged a further 15 targets in northern Gaza, which it described as compounds belonging to various militant groups, including hardline Islamic Jihad militants in the town of Beit Lahia, Haaretz reported. Meanwhile, the Palestinian media reported Israeli strikes targeted “several” residential areas, setting a mosque on fire in the town of Beit Hanoun. The spike in violence has reignited fears of a new, large-scale Gaza war looming in the region less than two weeks before the Israeli general elections. Military spokeswoman Maj. Mika Lifshitz said on Monday that Israel would move two armored and infantry brigades to the Gaza front and was calling up reserve soldiers. The last time the Israeli military invaded Gaza was in July 2014, when Tel Aviv blamed Hamas for the kidnapping and murder of three Israeli students found killed in the West Bank. The seven-week ground incursion resulted in multiple casualties among Palestinians. According to various estimates, over 2,100 Palestinians and 71 Israelis were killed. Thousands of Palestinians were injured.